Left to Right: Monmouth, Gibraltar, Victory, Pheobe, Amphion and, in the far distance, Renown, Donegal and Belleisle. 200 years after his death, Horatio Nelson is still Britain’s most popular hero. Over 1,000 books have been written about him and he has been the subject of more than 20 documentaries and films. He has even managed to find his way onto the world wide web! There are four great collections of items that belonged to him, or were made to commemorate him: at the Royal Naval Museum in Portsmouth, at the National Maritime Museum at Greenwich in the Lloyds Building in the heart of London and at the Nelson Museum in Monmouth. Other collections exist overseas – especially at the Mariner’s Museum at Newport News Virginia. And there are even plans to create a new museum in his honour in his native Norfolk. Nelson’s great victories at the Nile (1 August 1798) and Copenhagen (2 April 1801) made him an international hero in his own lifetime. He was mobbed in the streets, like a modern footballer or popstar and thousands of souvenirs were produced with his face upon them. When he was killed, at the height of the Battle of Trafalgar (21 October 1805) the whole nation was plunged into mourning and he was given a grand State Funeral and a splendid tomb in St Paul’s Cathedral. Statues of him were erected all over Britain and in the colonies, and yet more souvenirs were produced. So, why was he such a popular hero? After all, he did not look much like a hero. Although he was not as short as popular legend would have us suppose, he was still only 5 feet 6 inches (1.7m) tall – just about average height for a man of his time. And he was fairly thin, with a narrow chest and spindly legs. He suffered many wounds and diseases which left him often weak and ill. He caught malaria as a teenager and suffered from it for the rest of his life. He nearly died from yellow fever when he was only 22 years old. He lost the sight of his right eye when he was struck in the face during a siege on the island of Corsica in 1794. However the eye itself remained intact, so he never wore an eye-patch – that, too, is part of the popular myth! He was hit in the stomach at the Battle of Cape St Vincent in 1797 and suffered from a hernia for the rest of his life. He was badly wounded in the right elbow while attacking the Spanish island of Tenerife in the Canaries in 1797 and the arm had to be cut off without anaesthetic. And, finally, he was hit in the head at the Battle of the Nile in 1798 and suffered from concussion for many months afterwards. Physically, he looked battered, but otherwise unremarkable. He was very vain. He was awarded many medals and decorations for his exploits and he loved dressing up and wearing them. A contemporary once remarked: He looks more like the Prince of the Opera than a British Admiral! He had a very public love affair with Emma Hamilton, the wife of Sir William Hamilton, the British ambassador to Naples and he treated his own wife, Fanny Nelson, very cruelly. So why was he so successful, and why is he still so popular today? He was such a complex man that there are no simple answers to these questions. But some key characteristics do stand out. First, and above all, Nelson was extremely brave. He always led from the front and was always in the thick of the action. At the Battle of Cape St Vincent, he personally led a boarding party that captured two Spanish ships At the Battle of Trafalgar he refused to remove the stars of knighthood from his uniform coat because he did not want to set a bad example. As a result, his men could see that he was prepared to face danger alongside them, and so they were prepared to follow him into very hazardous situations. Second, Nelson always put people first. He was an affectionate and sensitive man and so relationships were very important to him. At home, he surrounded himself with his family and friends and he was especially fond of children. He and Emma Hamilton had one daughter, Horatia, whom he loved dearly. At sea he was warm and friendly with his men and took an interest in the health and welfare. He treated his captains as friends and equals and he shared his plans with them. He made it clear that he trusted them and always acknowledged their contribution to his victories. After the Battle of the Nile, he told Lord Howe: I had the happiness to command a Band of Brothers. Each knew his duty and I was sure each would feel for a French ship. They repaid his trust by serving him enthusiastically and so helped him to win some of the most decisive naval victories in British history. May the Great God whom I worship, grant to my Country and for the benefit of Europe in general an great and glorious victory; and may no misconduct in anyone tarnish it; and may humanity after victory be the predominant feature of the British Fleet. For myself individually I commit my life to Him who made me and may his blessing alight upon my endeavours for serving my Country faithfully. To Him I resign myself and the just cause which is entrusted to me to defend. Amen, Amen, Amen. He learned this faith from his father who was the parish priest of Burnham Thorpe, a small village on the north coast of Norfolk. And he later said, If I have any merit in not fearing death, it is because I feel that God’s power can shelter me when he pleases. Finally, Nelson was a born leader. He was not in fact a tactical innovator: most of his ideas had already been tried in earlier battles. 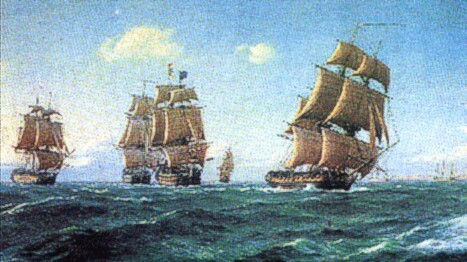 But he was able to turn those ideas into simple and inspiring battle-plans which he then communicated to his captains. Each one knew exactly what was expected of him. He wrote marvellous, vivid letters encouraging his officers and men and thanking them for their efforts. He had strong charisma, and an infectious enthusiasm, and so was able to inspire people to follow him. 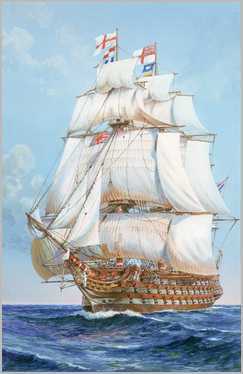 As his ships were sailing into battle at Trafalgar he raised the spirits of his men at exactly the right psychological moment with his famous signal: ‘England expects that every man will do his duty‘. Many other admirals have been as brave as Nelson. Some have been loved as much by their men. A few have been inspiring leaders. But only he has combined all these qualities in one frail and unheroic body. As his great friend and mentor, Lord St Vincent, once said, ‘All agree: there is but one Nelson‘. 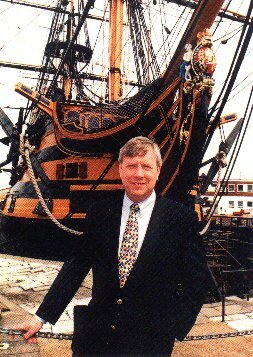 COLIN WHITE was the Deputy Director of the Royal Naval Museum in Portsmouth and a leading authority on Nelson. The Nelson Companion, which he edited, is a best-seller; his TV documentary, In Nelson’s Footsteps was screened in 1997 and his book, 1797: Nelson’s Year of Destiny received excellent reviews. He was co-chair of the Official Nelson Commemorations Committee and was Chairman of our sister society, The 1805 Club.